Tag: "Inertia", Freestyle, Mac Miller, Swimming. With King Push — Darkest Before Dawn: The Prelude out now, Pusha T stopped by Sway in the Morning to break down its lyrical content. 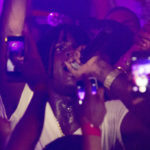 Additionally, Pusha T stepped up to the plate and kicked a mean freestyle. Check out the full interview and freestyle after the jump.